So its that time of year again when we buy so much chocolate that it will end up siting in the cupboard until next year when we throw some away and start again. Who am I kidding, not in this house. We’ll be lucky for it to last a week. So I was browsing through Facebook as you do and someone had shared a pic from M&S of a chocolate dinosaur for an alternative easter egg. Well Elijah loves dinosaurs and as we have lots of little eggs for them to find I thought this would be a fab idea. Off to M&S I go to find this dino and they only go and have a full Darth Vader head made from chocolate. Well, I had to get that for Reuben as star wars is his absolute favourite (at the moment). Then I thought I can’t really get Grace and Seth standard eggs now as the two boys have something special. Well, M&S didn’t let me down they had the frozen castle for Grace and the two Percy Pigs for Seth. 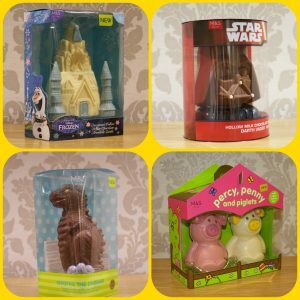 So £31.50 later (I know, I have no idea how that happened – Oops) I had 4 none egg easter egg treats yay. 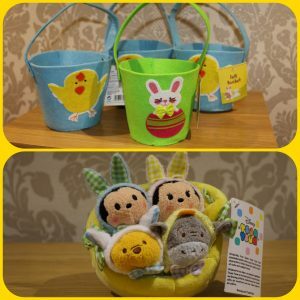 Also for Easter I have got the tiddlies some easter baskets to collect all their eggs that the bunny will leave them to find and the Easter Tsum Tsum collection from disney which is so cute. I will ditch the basket and give them one each then the basket will magically re-appear to store them in. Hope you all have a lovely easter and enjoy eating your weight in chocolate.